A Sales Rebound: How Real Is It? A variety of factors led to impressive quarterly sales for annuities and life insurance. Ohio National tells sellers they can kiss their trails goodbye. Before you can create a succession plan, you should have a continuity plan in place. It is a broader plan that accounts for everything that could interrupt the business. Here are four common succession planning mistakes and how to avoid them, from Anthony J. Martins, regional vice president for Securian. Succession planning is easier to get off the ground if one starts with a plan for the plan, experts say. With so many agents and advisors aging out of the business, how are they planning for transitioning their practices? 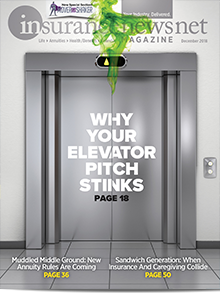 We look at some agency owners who are readying their successors for success. Reginald Rabjohns never let setbacks get in the way of the hard work of success or of helping others find success. Regulators see the need for new standards. But what those standards look like is the subject of ongoing, and at times contentious, debate with many sides. There was no such thing as summer vacation when it came to federal regulations. We look at what’s happening with the fiduciary rule and health care reform. The biggest sports stars are known for drawing large crowds inside the arena and living large outside it. Here are stories of how young athletes coped with sudden, massive wealth. Annuity sales are ready to rocket following the (98%) defeat of the DOL fiduciary rule. State and federal regulators have been battling for a decade to establish a fiduciary or best-interest standard for financial services. Much has happened already in 2018 to sap momentum from the Department of Labor and give it to the SEC. We handicap those agencies, plus what is happening at the state level. States are hardening their positions on the annuity best interest standard. The DOL rule may be paused, but it’s still a go for SEC, states, NAIC — and the DOL, again. 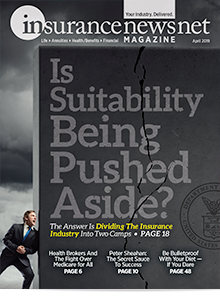 Besides the Department of Labor, the Securities and Exchange Commission, the National Association of Insurance Commissioners and individual states are piping up with their own standard, but will they harmonize? The National Association of Insurance Commissioners came up with a tentative framework for an annuity transactions model law. Are the First 401(k)s Ready for Retirement? Boomers might not have the pensions that their parents had, but they have healthy retirement accounts and a big need for advisors to help them make the right decisions. Some states begin looking at establishing their own fiduciary standards, while it doesn’t appear that the individual mandate repeal will undo the Affordable Care Act. Republicans engage late-stage horse-trading to save a tax cut bill and their chances in 2018 mid-terms. Republicans in Congress are under pressure to get the job done. Can they score a badly needed win? Employee Stock Ownership Plans (ESOPs) are a great way to cash out of your business and essentially turn it into a cooperative in the hands of valued longtime employees. Agency owners should think of succession planning as a five-year process to do right, said Chip Roame, managing director of Tiburon Strategic Advisors in Tiburon, Calif. Agents and advisors who have adopted a recurring fee system are finding that their agency has greater sales value when it comes time to sell the business. Tax reform is expected to overshadow health care reform as the major issue facing Congress. Health care reform may not be dead in Congress after all, and there could be some good news for the industry on the fiduciary rule front. 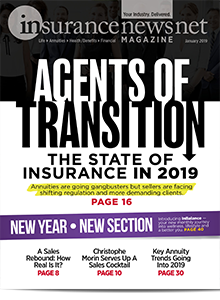 Insurance marketing organizations are figuring out the best route to take in selling annuities under fiduciary rules. During a frenetic week in July, the Department of Labor filed a brief defending its fiduciary rule, as well as a Request For Information signaling its willingness to amend the rule. We explain how the DOL came to seemingly opposite conclusions. Advisors share how they are creatively educating the wealthy athletes of the future, as well as the planning tactics they use to protect a wayward client as much as possible under the law. Is Half of Fiduciary the Last of Fiduciary? The fiduciary rule began taking effect, but it is far from a done deal. Health care and tax reform are two issues that the new president is trying to push through Congress, while the fiduciary rule might be too far along to be reversed. As attention pulls away from health care, Republicans work on coalescing tax plans. The American Health Care Act does nothing to address agent compensation, but industry groups say the bill is a step in the right direction toward fixing the health care law. DOL Fiduciary Rule Defies Industry, GOP Attempts to Kill It. Donald J. Trump is learning how hard it is to kill a regulation. The retirement market represents trillions of dollars but also hefty challenges. Are Agents a Part of (Repeal and) Replace? Trade organizations are fighting to make sure agents are included in discussions to reshape the Affordable Care Act. How an Election changed everything. The DOL's fiduciary rule is only one of the things likely to change under the Trump administration. A new rule will provide pension plan participants with more flexibility by giving them the option of a lump sum or an annuity. With just four months to go before the Department of Labor fiduciary rules begin taking effect, the agency is providing some much-needed clarity. Legal wrangling over the Department of Labor fiduciary rule is expected to carry well into 2017. Observers can’t rely on the usual partyline thinking, as the 2016 presidential campaign and election are set to break all the usual rules. 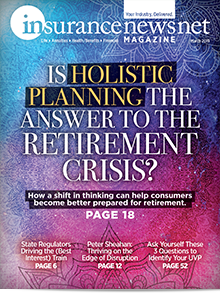 As regulatory pressure grows on annuities, interest shifts to indexed universal life. Will Clinton and Trump attack industry issues with traditional liberal and conservative ideology, or radically change course? The best interest contract exemption theoretically allows advisors to continue selling fixed indexed and variable annuities on a commission basis. But being in compliance could be tricky. What About Life Insurance in the DOL’s Fiduciary Rule? Could life insurance sales be subject to new Department of Labor fiduciary rules if the sale involves retirement money? Answer: It’s complicated. Do the classic sales methods still work in the Internet Age? 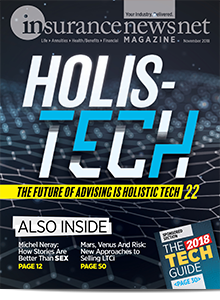 Here’s a look at how today’s advisors are taking the sales lessons of yesterday and making them relevant for a new generation of clients. The lawsuits focus on claims that the department overreached its authority and denied proper review after pulling fixed indexed annuities into the Best Interest Contract Exemption. We’ve all heard stories of world-class athletes who earned a fortune during their careers but ended up broke. How does that happen? Here are some tales of those who burned through their cash and others who parlayed their fame into lifetime wealth. When clients reject annities, even though they want a dependable revenue stream, a perception adjustment is in order. The rule should see light of day by late April, setting off challenges and accommodation. Will Annuities Miss the Retirement Train? 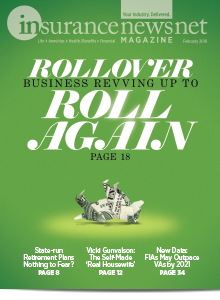 New retirement data from LIMRA foreshadows a prosperous IRA rollover market expected to reach $550 billion by 2018. Can insurance agents capture their share? Is the King of Annuity Hate fighting a losing battle? Political gridlock is one factor preventing the Securities and Exchange Commission from enacting its own fiduciary standard. The successful fight against the Securities and Exchange Commission’s effort to regulate fixed index annuities provides a blueprint. For those who sell annuities, the Department of Labor’s proposed fiduciary rule will bring either a significant shift or a disastrous disruption to the way they serve their clients.